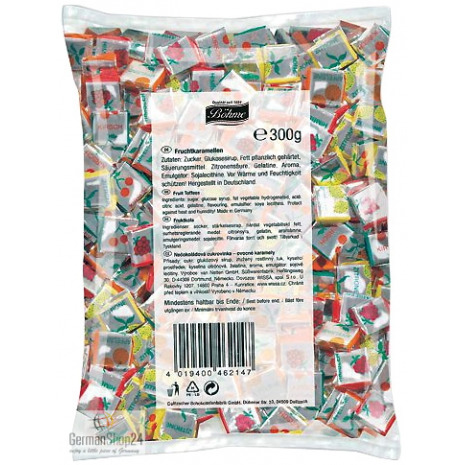 Individually wrapped, small chewy candies in the flavors raspberry, cherry, orange and lemon. Traveling back to the childhood is fun because the fruit flavored caramels by Boehme belong to the classics among the sweets for many years. 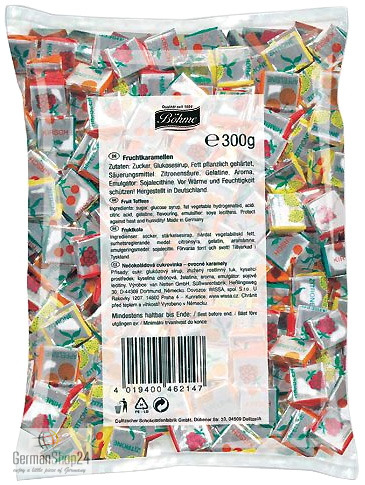 These small chewy candies with cult status are individually wrapped and convincing in the following flavors raspberry, cherry, orange and lemon. Not only for Carnival a must but also a great idea for the next children's birthday party or ideal as giveaway. Size of one chewy candy: 0.8" x 0.8" x 0.2". My Kids and wife got very quickly addicted to them like almost every German did when they had them for the first time. The taste is debatable but the addiction is real. Sugar, glucose syrup, hydrogenated vegetable fat, citric acid, gelatin, flavoring, emulsifier: SOY LECITHIN. Zucker, Glukosesirup, Fett pflanzlich gehärtet, Säuerungsmittel: Citronensäure, Gelatine, Aroma, Emulgator: SOJALECITHINE.